NODA Tetsuya was born in 1940 in Kumamoto prefecture, graduating from the Tokyo University of Art in 1963. He later studied with the acclaimed printmaker Ono Tadashige (1909-1990). Since the 1960s he has been internationally acclaimed, showing at numerous biennales and winning a number of international prizes such as the grand prize at the Tokyo International Prints Biennial in 1968 and the Norwegian International Print Biennial in1978. NODA Tetsuya is considered one of Japan's most important living printmakers. NODA takes and uses his own photographs as the basis for his prints, producing a stencil which he then uses to silkscreen an image. He uses the Japanese-style woodblock process to add a background, generally on a textured paper, which is usually subtle in tone. Thus from a distance his works look like photographs, but on closer inspection they demonstrate an intensity and obliqueness which express a Japanese persuasion and the sensitivity of the artist. At the same time, through the process of printing and working with paper, they also express the personal nature much of the work has for him. 'June 11th 1971',is one of the works NODA used to announce his conversion to Judaism (another work done soon after, 'Diary, June 26 1971', in the same way was used as a recording of his marriage to Dorit Bartur, who was from Israel). There is a sense of mystery which seems to pervade this work on first viewing. 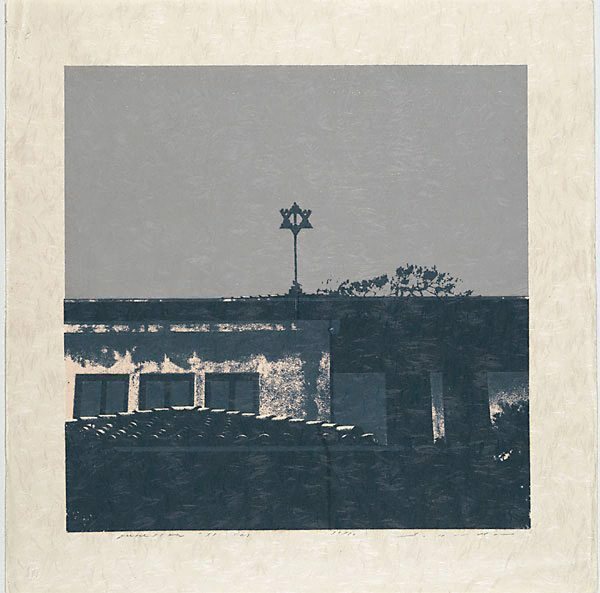 The Star of David, an important and prevalent symbol of Judaism, is shown on the roof of a building which is the synagogue he was taught at in Japan. It stands directly in the centre of the image, against a light sky, positioned for all to see, fully exposed and clear in its purpose. The mystery that surrounds the star - which is full of meaning and at the same time represents many unsolved questions - is also evident in the print, which has a stillness surrounding it, particularly in the form of the building it stands on, of which the symbol, although small in size, is a major part.